Chronic inflammation is caused by an over-expression or lack of control of the normal protective mechanisms and has been linked to heart disease, osteoporosis, cognitive decline and Alzheimer's, type-2 diabetes and arthritis. Current medications include treatment with steroids that reduce inflammation or swelling. Long-term use of non-steroidal anti-inflammatory drugs can cause several side effects and in extreme cases can cause severe haemorrhage and renal effects. There are other various anti-inflammatory nutrients which reduce the level of these biomarkers. The polyphenols show significant anti-inflammatory, anti-oxidant and anti-DNA damaging effects. Anti-inflammatory foods such as whole grains, fruits and vegetables, which provide valuable antioxidant polyphenols, resveratrol, lycopene, phytosterols, curcuminoids, quercetin, epigallocatechin gallate, phenolic acids, alleviates inflammation, as well as strengthening the immune system. 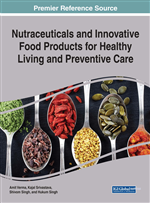 The present chapter would thus focus on the phytochemicals of nutraceutical importance for combating inflammation naturally. Inflammation is induced by the release of chemical mediators from damaged tissue and migratory cells. Mediators identified in the inflammatory process include vasoactive amines (histamine and serotonin), eicosanoids (metabolites of arachidonic acid, prostaglandins and leukotrienes), platelet aggregation factors, cytokines (interleukins and tumoral necrosis factor - TNF), kinins (bradykinin), and free oxygen radicals, among others (Ohishi, 2000). These substances are produced by inflammatory cells such as polymorphonuclear leukocytes (neutrophils, eosinophils, basophils), endothelial cells, mast cells, macrophages, monocytes, and lymphocytes (Fiala et al., 2002). It is well established that main phenomenon activating the acute phase of inflammation is the local production of prostaglandins (especially PGE2) and leukotrienes derived from arachidonic acid. These eicosanoids are relatively unstable and are notoriously non-selective in their interaction with various receptor subtypes (Hata, & Breyer, 2004). Anti-inflammatory drugs make up about half of analgesics, remedying pain by reducing inflammation, as opposed to opioids, which affect the central nervous system. Current medications include treatment with steroids which are specific glucocorticoids that reduce inflammation or swelling by binding to glucocorticoid receptors. These drugs are often referred to as corticosteroids. The other treatment includes non-steroidal anti-inflammatory drugs (NSAIDs), which alleviate pain by counteracting the cyclooxygenase (COX) enzyme. On its own, COX enzyme synthesizes prostaglandins, creating inflammation. In whole, the NSAIDs prevent the prostaglandins from ever being synthesized, reducing or eliminating the pain. Some common examples of NSAIDs are: aspirin, ibuprofen, and naproxen. NSAIDs are generally indicated for the symptomatic relief (Simone, 2006; Koeberle, & Werz, 2009). Long-term use of NSAIDs can cause several side effects like gastric erosions, which can become stomach ulcers and in extreme cases can cause severe hemorrhage and renal effects. There is an urgent need to find safer compounds and to develop mechanism-based approaches for the management of such diseases. The polyphenols show significant anti-inflammatory, anti-oxidant and anti-DNA damaging effects. Based on the epidemiological evidence and laboratory studies conducted using in vitro and in vivo systems, it is suggested that routine consumption of these polyphenols may provide efficient protection.